Blog The 2018 Camping Season Is Here! Gorgeous skies, mild temperatures, recreation all around, events almost every weekend….. 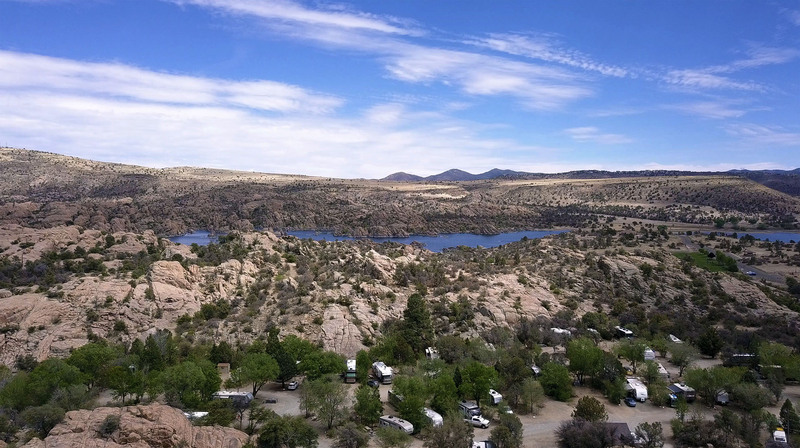 It sounds like the 2018 Camping season is upon us here at Point of Rocks in Prescott Arizona! The RV camping season is in full swing here at our park. We’ve been filling up quickly over the last few weeks as visitors pass through the park for a few days or weeks at a time. And we’re happy to see so many returning guests once again this year! As the summer heats up here in Arizona, Prescott always offers cooler temperatures and great things to do on the weekends and week days as well! We’re proud to say that we are continuing to improve services and ammenities here at Point of Rocks. Last year added 50 AMP service to many of our spots on “the upper loop”, as well as all of the improvements to the office area. This year we’ve completely renovated the shower and restroom facilities at the office. Every year we’re planning to add improvements over the winter season for your camping enjoyment. Finally, we wanted to mention the events and activities coming up in Prescott this year. The summer season promises a lot of great events on the Courthouse Square, and throughout the greater Prescott area as well. You can always check our Events Calendar by clicking on this link. But to give you an idea of what’s coming up this year take a look at the quick list below for some of the most popular events. May – Phippen Art Show on the Square. The 26th through 28th of May. June – The Blue Grass Festival. The 23rd and 24th of June. 4th of July – The annual 4th of July celebration on the Courthouse Square. Including a fantastic parade through downtown Prescott. If you’re looking to enjoy all that Prescott has to offer this year, be sure to get in touch with us and make a reservation ahead of time. It’s our busy season now, and we want to make sure we have an open site for you! Click here to make your reservation today!